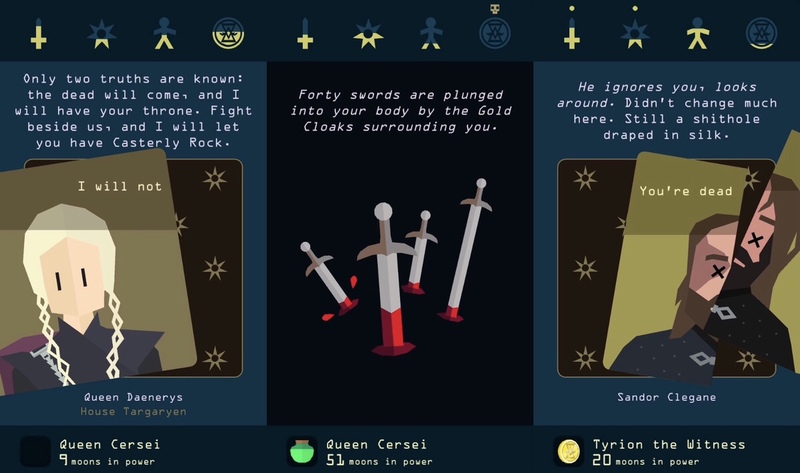 In 2016, Nerial’s first Reigns game took the world by storm with its super simple controls that felt perfect for touchscreens — just swipe left or right to make choices. Combined with a challenging high score-chasing gameplay loop and cryptic meta game to uncover if you manage to follow all the clues, there’s something for everyone. The basic premise is that you’re a king who has to balance four different factions — the army, the church, the people, and the bank. If any of the four meters run out or fill up completely, your reign is over and a new king takes on the throne. It’s a clever idea somewhat reminiscent of Infinity Blade, and together with its stylish art direction and dark sense of humor, it’s not hard to see why it became such an instant hit. 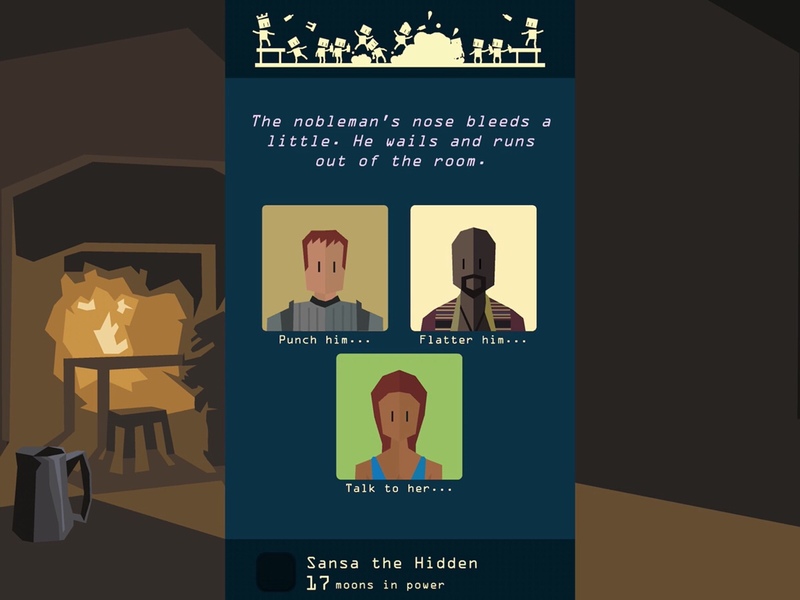 The sequel, Reigns: Her Majesty, released less than a year ago and put the player in the queen’s shoes. It was a much more feminist take on the formula and the humor spoke to me on a higher level than the original. 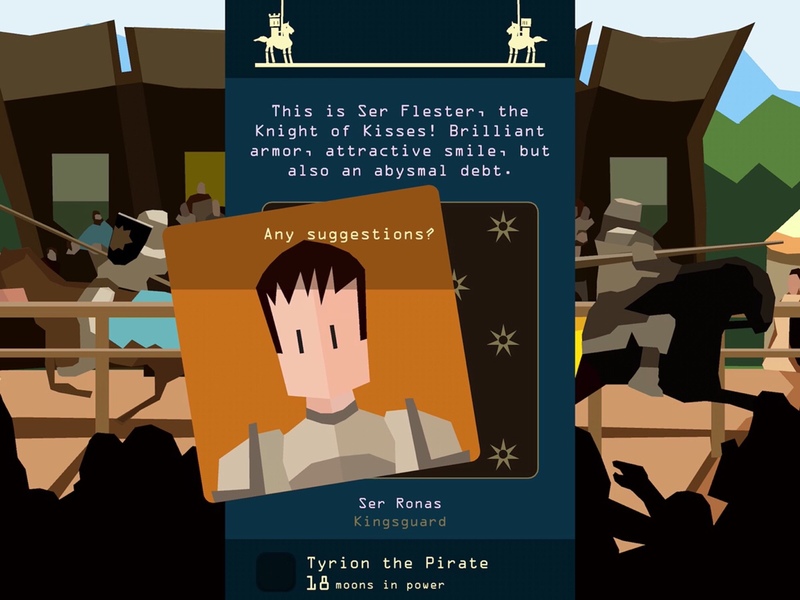 So now, here we are just a couple of short months after the announcement of the third game, Reigns: Game of Thrones. It was made in conjunction with HBO and promises to satisfy fans of both the games and television series. So does it hold up to its promise? Keep reading to find out. As far as the show goes, I might not be the best person to ask. I binged the first three seasons when I had a free trial of HBO years ago, ending at the completely insane Red Wedding. I tried to get back into it a few months ago, but realized that I had forgotten too much and found it confusing. So I gave up, at least for now, until I have the chance to rewatch from the beginning. Still, I remember enough to know who I’m meant to like and who I’m supposed to despise. The game takes place in the current season, so there are some characters missing who I knew — that’s the nature of Game of Thrones, right? Don’t get attached to anyone because they’ll die horribly sooner or later. You’ll still get to meet Samwell Tarly, Melisandre, and some other recognizable faces. I’m sure I would have enjoyed the story more if I were up to date with the show, but I was still able to follow along enough to have a good time. If anything, it’s given me an incentive to get back into the show so I can put more of the pieces together. But even if you haven’t watched any of it, I think there’s plenty of fun to be had if you don’t mind the occasional confusion. For fans of the games, there’s a ton of new features that have been added. So even if you don’t care about the theme, you’ll be too distracted to notice. The most obvious difference is seen right off the bat. Instead of just playing as king or queen, you get to choose from multiple rulers this time. 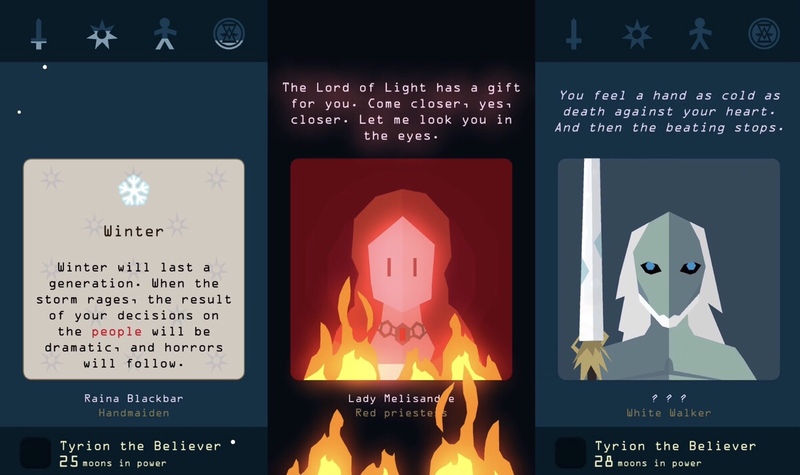 You start with Daenarys and unlock Tyrion, Jon Snow, Cersei and others through play. What I loved about this is that it cuts down on the tedium and repetitiveness of the previous games. The characters share some cards and events, sure. But they each have their own individual cards and events that are unique to them. You may need to play as a specific ruler to meet one of the other rulers, or just to achieve a certain objective or death. Playing with one ruler may even give you a clue that will help with another. Unlocking all the characters shouldn’t be too difficult, but for those who want to see the true ending or find all the cards, deaths and objectives, you’ll have to work a lot harder. The multiple rulers means you have many more options in front of you. You may have seen a card somewhere that was important but not remember where. So it could involve more backtracking. But often when I went looking for one thing, I discovered something else I didn’t even know I needed. The scope of the game meant it held my attention far longer than the previous games, even though the high score chasing doesn’t excite me quite as much as it used to. Another great addition is the ability to travel to different locations. Each ruler starts in their own kingdom, but they also often visit each other. Some can even start battles with other kingdoms, either passively through a commander or by leading the charge. If you choose the more active role, you need to then decide which part of your army to respond with. For instance, do you send your knights to fight their wildlings and the infantry to fend off their archers? Perhaps you even have a dragon at your disposal, but when’s the best time to utilize it? There is some trial and error involved in these parts of the game, but there’s also logic. Even when I was frustrated due to failing a specific battle numerous times, I still appreciated the change in pace from binary choices. And these detours can be right around the corner, too, in the form of tavern brawls and jousts. Each one involves making tough decisions, but they’re different enough to feel unique in their own right. I was so proud of myself the first time I won a joust because it felt like a real accomplishment. I also feel I have to mention the little touches that add a little extra flare to the game. For instance, during winter you’ll see snow fall. And if you tilt Milesandre’s card left and right, the flames dance. Or you may notice glowing eyes lurking in the shadows at only certain moments. Together with all the new background art to accompany the different locations you visit, it really feels like the series has come a long way since its humble beginnings. The studio could have probably gotten away with less, but they went all out instead. Each character even has their own individual permanent ability they can unlock that makes it easier to survive for longer. And your journey will be accompanied by the official Game of Thrones soundtrack, so I recommend playing with headphones. Even if you shut the music, the ambient sounds of birds and creaking dungeon doors are worth hearing loud and clear. If you’re sick of Reigns and don’t have any strong feelings about Game of Thrones, you might want to steer clear of the game. But if you still have room in your life for more swipetastic kingdoms, I would say this game is the best of the three due to its scope and variety. I prefer the humor of Her Majesty, but even that wore itself thin after a while. The latest game stays fresh far longer due to the sheer amount of stuff there is to do. If you haven’t played the previous games, this is as good a place as any to start. And if you have but aren’t sick of them yet, it’s an easy choice to make. Those who are all caught up on the show will have a better time with the game, and it’s pretty much a no-brainer for those fans. 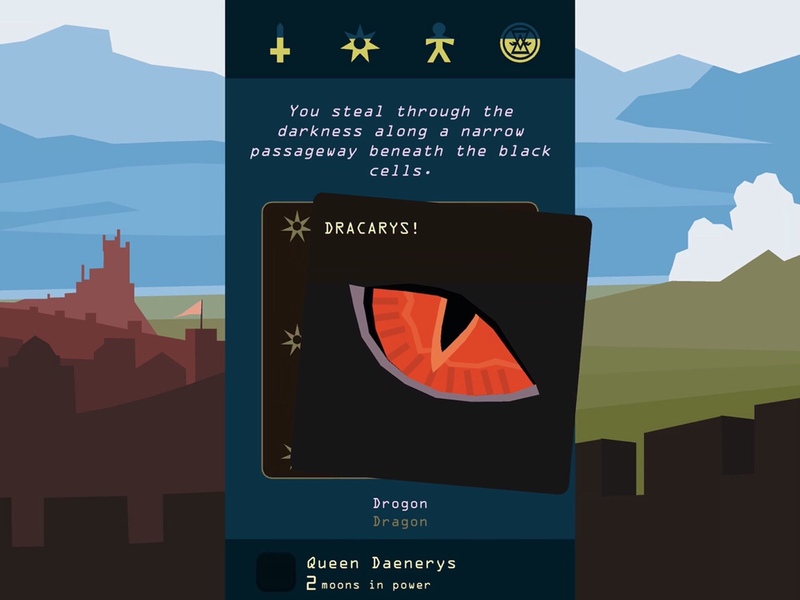 The game is clearly meant to cater to Game of Thrones fans, but don’t be dissuaded from playing if you don’t know your Stark from your Lannister. There’s plenty of fun to be had here either way, and you may even find yourself binging the HBO series once you’re done. So what are you waiting for? Winter is coming, so don’t waste any more time and grab the game here. And if you’re stuck on any part of the game, you can find all guides here.